That’s just cluttering up your database and going to make things tricky down the line. So now, you want to clean it up. Back up your database before you do this! You could easily lose tons of data if you screw up even one little line, or even by using what I have exactly. Just back it up, already! Find the_content(); or really any part of the code that you can recognize. This is where we’re going to put our code, so we can load up a specific page and make this all happen, and watch it do its job in real time. We’re concerned with that number, in my case it’s 6199. Yours will be different. This is the page’s ID. Let’s walk through what each piece of this code does. Here we simply say, “If we’re on Page 6199, run this code.” We only want to run it on this page, because we don’t want people executing the code just by visiting any page on our website. Here we create an array, which is basically like a box we can store a bunch of stuff in. In this case, the stuff we store in the box is called our variables. We’ll add these variables to this array later in the code. Next, we’re setting up the arguments (ie, $args) for our WP Query. A WP Query is more or less the backbone of how WordPress displays content, and more specifically how it knows what specific content to pull from the database for us to show on the front end of the site. If you have less than 500 products, you’re all set. If you have slightly more (and a good server), you could change the second line there to 'posts_per_page' => -1, – this -1 tells WordPress to just go ahead and grab all results that match, instead of limiting it to just 500. You can also change this number to something lower, like 100 or 20 if your server is really hanging up and you’re seeing errors. This takes our arguments and actually runs the code to go and get the results. So we basically check to see if a variation’s title is already in the array, if it is then we delete this occurrence and if not, we add it to the array so that the next time it shows up, we’ll know we should delete it. Note that this only happens each time you refresh the page, it’s not stored in a database anywhere or anything like that. All of the code after that just closes up our WP Query, but it is definitely necessary. Now, if you’ve used 'posts_per_page' => 500, and 'offset' => 0 like in my original example, but have more than 500 variations, then you need to update this code each time you run the page. For example, you’d change the offset by the same number as the posts_per_page, so in this case, on our second pageload we’d use 'offset' => 500, on our third we’d use 'offset' => 1000, on our fourth 'offset' => 1500 and so on. Just always increment by the same number as you’re using in the posts_per_page setting. Keep going until you don’t have any duplicates left, ie you never see that “VARIATION NAME duplicate deleted.” message again. There’s a plugin out there by the name of Delete Duplicate Posts. This seems to do a good job at bulk deleting duplicates, however, it doesn’t work with product variations (it works fine with normal products) right out of the box. Luckily, we can easily manipulate it with a browser like Chrome. 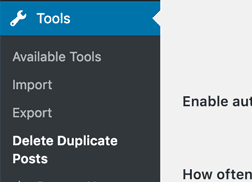 Install the plugin and activate it, then go to its settings page which is under Tools > Delete Duplicate Posts. 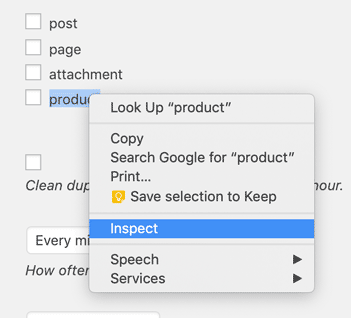 Now, put your cursor over the “product” checkbox, and right click, then choose Inspect. This is all we need to change. Where it says value="product", click on the word “product” and you can edit it. Change it so it reads value="product_variation"
That’s all, you can close that new inspector portion of the browser window and scroll down to Save Settings. Click that and you’ll get a list of all duplicate product variations. 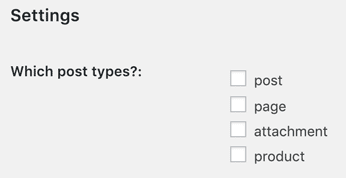 Note that if you click Save Settings and need to do this again, you have to do the whole Right click, choose Inspect and edit “product” to “product_variation” again, as this is just temporarily modifying the code. That’s it, enjoy, and I hope you backed things up because even if they didn’t go wrong this time, Murphy’s Law and all, y’all! You’re a life saver!!!!! I couldn’t export my products to ebay from my store because of duplicate variations and now I can!!!! Thank you so much! !